The Kvinna till Kvinna Foundation's strategic course is set by the Board. Our secretary-general, Petra Tötterman Andorff, leads the organisation’s daily operations. 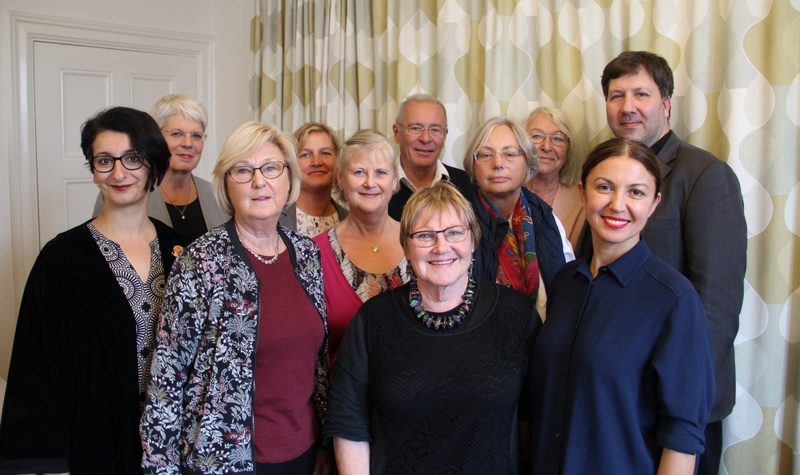 Kvinna till Kvinna’s Board is elected every fourth year by WILPF Sweden (Women’s International League for Peace and Freedom) and the Swedish Peace and Arbitration Association. The Board meets seven times a year. It is chaired by Birgit Hansson. Licensed psychologist, honorary doctor (Stockholm University). Former chairperson of the Swedish Psychological Association and rector of the Swedish National Police Academy. Former member of the Swedish parliament, ambassador to Syria/Lebanon, secretary-general of the Olof Palme International Center and chairperson of the Swedish UN Association. Area director, Save the Children Sweden. Former secretary-general at the Swedish Foundation for Human Rights. Emeritus professor of education, Stockholm University. Board member of Men for Gender Equality, the Fredrika Bremer Association and Feministiskt Perspektiv. Head of the Feminist Initiative party’s registry at Stockholm City Hall. Former financial journalist and foreign correspondent based in Brussels. Head of Uppsala’s municipal upper secondary education and adult education. Former teacher and president of Women in the Church of Sweden. Human-rights strategist, City of Stockholm. Sustainability manager, Swedish Property Federation. Former chief-of-staff at the Government Offices of Sweden and permanent secretary at the Swedish Liberals’ Parliamentary Secretariat. Former HR manager and leadership and organisational consultant. Petra Tötterman Andorff is Kvinna till Kvinna’s secretary-general. She has extensive experience of working with women’s rights. Petra has been secretary-general of the Swedish branch of WILPF (Women’s International League for Peace and Freedom) and international coordinator for WILPF in New York. Petra became deputy secretary-general of Kvinna till Kvinna in December 2014. In June 2018, she was appointed secretary-general. Besides the Board, Kvinna till Kvinna also has a Council. Council members act as goodwill ambassadors, back fundraising campaigns and raise awareness of Kvinna till Kvinna in their networks. Current council members are Monica McWilliams and Peter Wallensten.